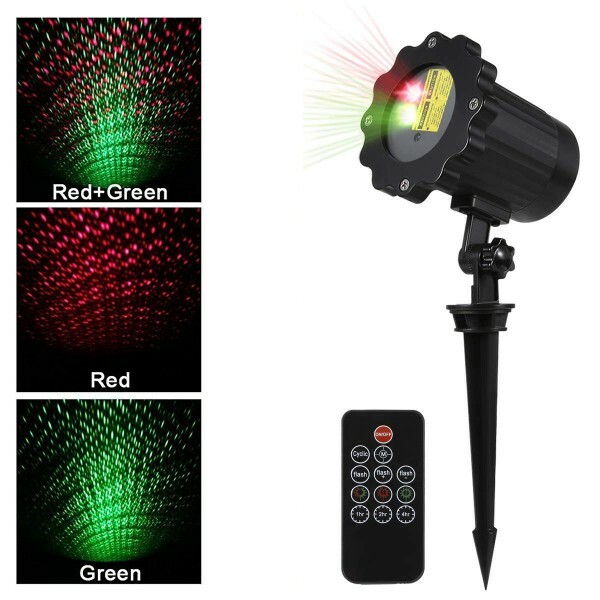 【Moving Multi-pattern Red/Green All star Laser Light】3 Modes-Single Green, Single Red, Green & Red Mixed. Images Moving /Stationary Flashing. (Always flashing, can't set one stationary pattern). 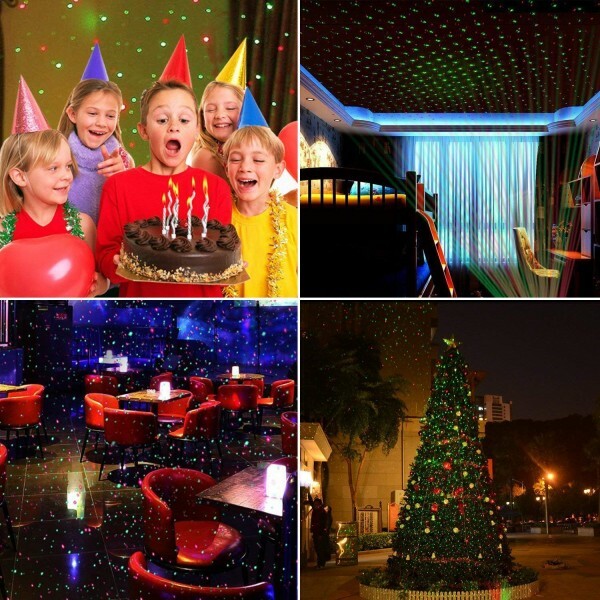 【Magical Laser Show】 It contains Christmas tree, Christmas socks, Santa Claus, Bells, Snowflaker, Cupid, Sky Stars. Random combinations of different patterns sparkling on your house. 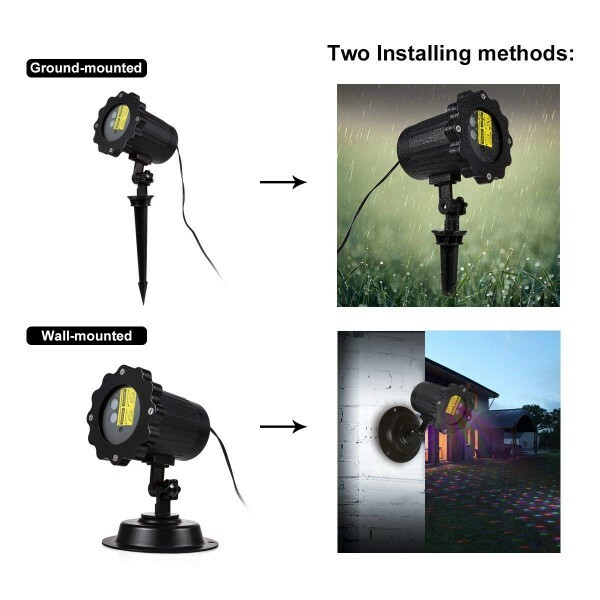 (16ft to 49ft is the best projector distance, the more closer the laser light and object, the more brighter the light performance). 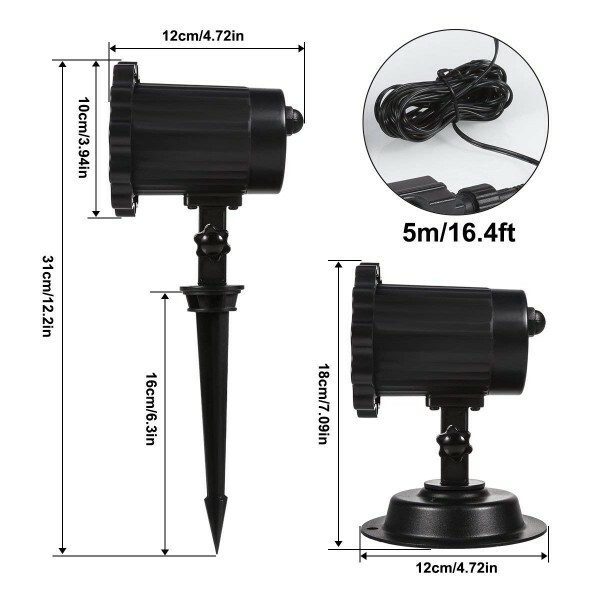 【Powerful Wireless Remote Function】 About 5M/16ft remote control distance; Built-in timer turn on the same time every day or night. The default settings automatically stops after running 1, 2, 4 hours; Moving and flashing speed can be adjusted according your mood. 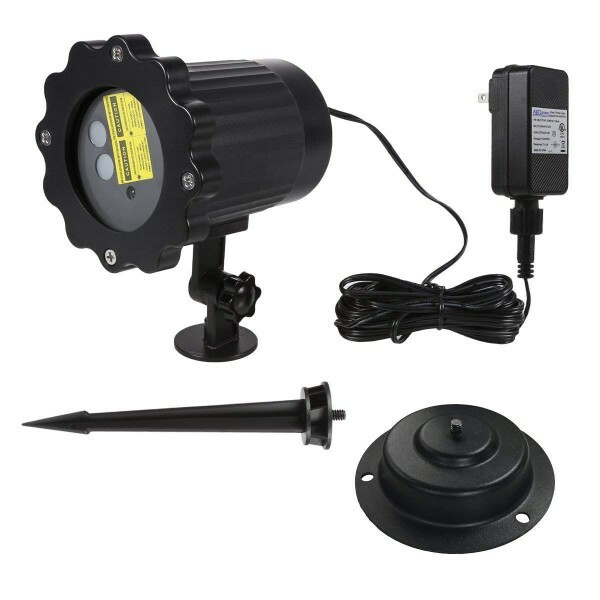 【Waterproof Outdoor Christmas Light】IP65 Christmas projector is the best Christmas lighting solution, enable to withstand any kind of weather including rain, snow, dust and intense sunlight (Working Temperature -20℃-30℃). 【Buy in Confidence】UL Listed Power Supply. FDA, CE, FCC, ROHS certifications. IP65 Wwaterproof test report. 30 days money back and 1year warranty service. 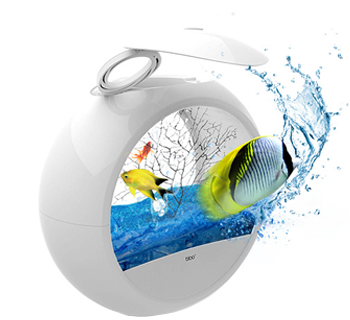 No any worry to buy this laser projector . Specifications: Laser Classification: ClassII (safe standard) Maximum laser power(single beam): less than 1mW. Material: durable plastic casing. Install Method: In-ground mounted/Wall mounted Projection effects: more than 1000 dots. Timer: 1H, 2H, 4H. 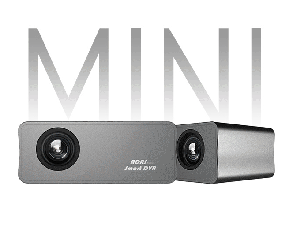 Input: 110V-240V, 50/60 HZ. Output: DC5V 1A Cable length: 5m/16.4ft. Applicable temperature: -20℃-30℃. 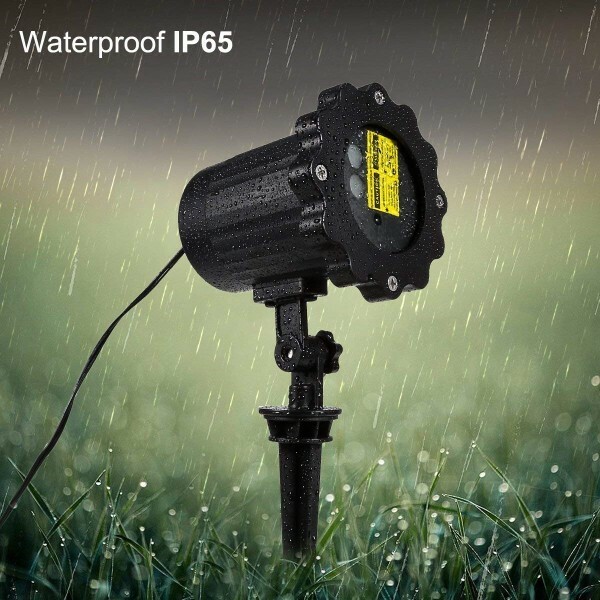 Waterproof level:IP65 light casing and IP44 adaptor. Remote: Cyclic: Multi Patterns Flashing Cycly M: Dynamic Cycle Flashing/Stationary Cycle Flashing Flash: Single Red Single Green Flash Cycle Flash+/Flash-: Moving and Flashing Speed Control Suggestions and Tips: 1. Remote align to the light sensor to operate. 2. Operate in temperatures -20℃ to 30℃. The green light may be a slight delay if operating in a very cold area. Please let the light warm up 5-10 minutes indoor. 3. A normal phenomenon for all laser lights, that red light power is the largest, 650nm, which is for the safety of the product to consider, the human eye is not sensitive to red light, so it may mistakenly believe that the red light is weak, compare with green light.